We love our newest Thanksgiving Minnie Mouse Pumpkin dress/outfit! 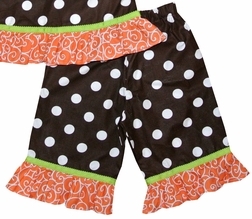 We take a brown with white dots fabric with orange and white swirls ruffles and make a dress or swing top and trousers. The top and trousers are embellished with lime scalloped edge small ribbon about the ruffles. 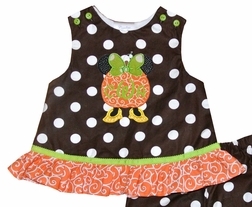 The front of the dress/top is appliqued with Minnie as a pumpkin with a large green with white dots bow and yellow with small white dots shoes. Her ears are made of black with tiny white dots fabric. You can leave the pumpkin, that is made with the swirls fabric, blank or can put your little one's 3 initials or name in it.